Zanskar the Virgin Valley is one of the most fascinating destinations in the tourism circuit of Leh and Ladakh. It is situated to the southwest of Leh and southeast of Kargil. Regarded as a place with distinct topography and surprising panorama, this semi-desert area falls in the northern territory of the Himalayas. It is flanked by Doda and Kargyag rivers, which are tributaries of the Zanskar River. Nimu: Nimu is located in the South east of Ladakh Region and is 35 km from Leh, Jammu & Kashmir, India. Nimu is a stop for all the river rafting groups and is the main starting point for the annually-held all-India river rafting expedition, which is done in the Indus River. The temperature here varies from +40 °C in summer to −29 °C in winter. Due to such hard climate and extreme weather conditions this area has very little vegetation cover (as seen in picture on right). Pathar Sahib Gurudwara: The Pathar Sahib Gurudwara which is 25 km from Leh Falls between Leh and Nimu en route. Drang-Drung Glacier: 22km long Drang-Drung-Glacier is the largest glacier accessible to tourists in the Ladakh region. In fact Drang Drung is located in heights of Zanskar. Drang Drung glacier is the source of Doda River and one can trek upto the glacier from Padum. the Stod river also has its source at the Drang Drung glacier. Drang Drung glacier can also be seen from the Pensi La pass. Pensi-la (Pensi Pass) almost midway between Padum and Rangdum. The glacier in fact looks like a winding river from Pensi la, the difference being that instead of water its a river of ice. Drang Drung is one of the major attractions of Zanskar region and augments the chanrm of this adventure junky paradise! Phuktal Monastery: Phuktal Gonpa is a Buddhist monastery located in the remote Lungnak Valley of Zanskar, in the autonomous Himalayan region of Ladakh, Northern India. Built around a natural cave believed to have been visited by important sages, scholars and translators beginning around 2,550 years ago, the present Phuktal Gonpa of the Gelug lineage was established in the early 14th century by Jangsem Sherap Zangpo, a disciple of Gelug founderTsongkhapa. The Road: Phuktal Gonpa is one of only a few Buddhist monasteries in Ladakh that can still be reached only on foot. All supplies are brought by horse and donkey, and, in winter, on the frozen river. A road will be built to Phuktal within 3 to 4 years, but for now, it is still a day’s walk from Dorzang, the end of the road leading from Padum. Zangla: Zangla is situated on the northern side of Zanskar at the extreme edge of the 35 kms long road that begins from Padum. Zangla was ruled by a titular king till his death about two decades back. An old castle is located on the hills, which is now in ruins. From the castle a panoramic view of the deserted valley below can be had. An old nunnery is located nearby and an old monastery is situated in the close village of Tsa-zar, famous for its beautiful frescos. From Zangla trips to most of the cultural sites of Zanskar like Padum-Strongdey-Zangla-Karsha-Padum trip. Zangla is also the basecamp for the Padum-Markha valley treks. Zangla is the take-off point for the Padum-Lamayuru and the Padum-Markha treks, as well as for the ‘Chaddar’ trek over the frozen Zanskar river to Nimu, which becomes feasible only during the middle of the winter. DZONGKHUL: The other spectacular cave monastery of Zanskar, Zongkhul falls on the Padum-Kishtawar trekking trail, just before the ascent to the Omasi-la pass begins. Built like a swallow’s nest on the rock face in the Ating gorge, the monastery is associated by legend with the famous Indian Yogi, Naropa, who is believed to have used for meditation the two caves around which the monastery has been developed. A footprint on a stone near the ingress of the lower cave is highly revered as that of the yogi. The frescoes on the cave walls are very old and reflect a high degree of artistic achievement. These are believed to be the original murals executed by Zhadpa Dorje, the famous scholar-painter of Zanskar who was active in the same monastery about 300 years ago. History: Its foundation is attributed to Naropa (956-1041 CE), who was a celebrated Indian Buddhist yogi, mystic and monk from the renowned Vikramshila University in Bihar. He is said to have meditated in one of the two caves around which the gompa is built and the monastery is dedicated to him. His footprint can be seen in the rock near the entrance to the lower cave. The gompa contains images and thankas of famous Drukpa lamas. Zhadpa Dorje, a famous painter and scholar created some of the frescoes on the cave walls almost 300 years ago. STONGDEY: Perched on a rocky outcrop overlooking the oasis-like village below, the picturesque monastery of Stongdey lies 18 kms to the north of Padum on the Padum-Zangla road, Ladakh region, J& K at an Altitude of 3,500m. An old foundation associated with the Tibetan Yogi Marpa, Stongdey is now the second largest monastic establishment of Zanskar, which is inhabited by a resident community of about 60 Gelukpa lamas. The sprawling white washed complex has a number of temples, among which the Gon-Khang containing several fierce-faced veiled deities is of particular interest. The climb up to the monastery from the roadside is rather strenuous, but it is worth the trouble for the breathtaking scenery of the valley available from here. The sprawling whitewashed complex has a number of temples, each a repository of the region’s rich monastic legacy. Stongdey can be reached by foot in about 4 hours along the recently laid rough road. The climb up to the monastery is rather strenuous, but it is worth the trouble for the breathtaking scenery of the valley available from here. Panikhar: Panikhar is located in the Suru valley by no means it is a large inhabited area. A bus ride from the south of Kargil will take three hours to reach Panikhar. 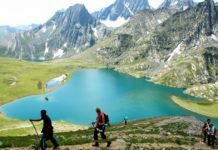 Prior to the Kashmir troubles, it was a minor trekking centre, at the start of the Lonvilad Gali Pahalgam Trail. It is a good atmospheric place to take a break from the continuous journey to Padum. These days the roadside collection of shabby stalls and poor mud-brick farmhouses spots very few tourists even during the season period. The stop is because people hike to the nearby Parkachik La for seeing vivid pictorial views of the glacier gouged north face of the mighty Nun-Kun Mountain. The track heads off on the far side of the Suru, crossed via a suspension bridge thirty minutes south of the village. 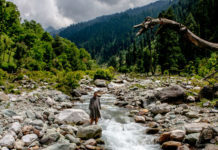 It may look straight forward from Panikhar but the four-hour hiking may be very difficult to reach the top, particularly if one is not used to high heights. However even familiar trekkers may be frightened by seeing the sight when they arrive at cairns. The mountain is covered by cloud and the stream flows from its huge peak, the Nun situated over there go via boat 3500m above the valley floor. Karsha: Karsha Monastery or Karsha Gompa is a Buddhist monastery in the Padum Valley of the Zanskar region of the state of Jammu and Kashmir in northern India. The Doda River flows past the monastery from its source at the Drang Drung glacier of the Pensi La (14,500 feet (4,400 m)). It was founded by the translator, Phagspa Shesrab.The monastery, also known by the name “Karsha Chamspaling’, was founded by Phagspa Shesrab, under the Gelugpa Order or the Yellow Hat Order. Karsha is the largest monastery of Zanskar and is an imposing complex of neatly white washed building blocks comprising several chapels, besides residential cells for its nearly 150 lamas, who belong to the Geluks-pa sect. Built picturesquely along the steeply rising mountainside above Karsha village, the monastery can be seen from far. The central building is a large assembly hall housing an array of figures and the ornate throne of the Head Lama-incarnate. Three adjoining chapels contain numerous statues and other art objects, among which a set of exquisite silver and copper chortens are worth noting for their beauty. Of particular interest in the complex is the Lhabrang, a large temple accessible through a vent in the roof, whose partially damaged walls are still adorned with the original frescos believed to be more than 300 years old. The event to witness at Karsha is the 3-day Gustor festival held in early July when thousands of devotees throng the monastery to witness the mask dances performed by the lamas. 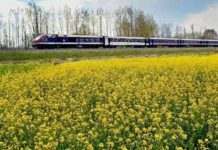 Next articleSpend a day in Kokernag and go mesmerised !